The Japanese have a designation for artists and craftspeople “who have attained high mastery” of their art – Kakko Nintei. 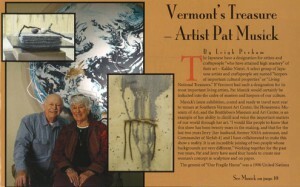 A select group of Japanese artists and craftspeople are named “keepers of important cultural properties” or “Living National Treasures.” If Vermont had such a designation for its most important living artists, Pat Musick would certainly be inducted into the cadre of masters and keepers of our culture. Musick’s latest exhibition, crated and ready to travel next year to venues at Southern Vermont Art Center, the Housatonic Museum of Art, and the Brattleboro Museum and Art Center, is an example of her ability to distill and voice the important matters of our world through her art. “I would like people to know that this show has been twenty years in the making, and that for the last two years Jerry [her husband, former NASA astronaut, and Commander of Skylab 4] and I have collaborated to make this show a reality. It is an incredible joining of two people whose backgrounds are very different.” Working together for the past two years, Pat and Jerry have used four hands to create one woman’s concept in sculpture and on paper. The genesis of “Our Fragile Home” was a 1990 United Nations Earth Day Celebration over twenty years ago. Astronauts and cosmonauts from around the world were invited to the United Nations to speak about their first impressions of the earth seen from the distant perspective of space. Sitting in the audience, wearing a simultaneous translation headset, Musick was stunned to hear the space travelers – speaking English, French, Russian, Spanish, German and Arabic – describe earth with the same eight words: fragile, beauty, harmony, balance, protect, sustain, nurture, and steward. Since that moment of awakening to the fragility of our world as seen from space, Musick has contemplated creating an artist’s rendering of the uneasy balance between mankind and our only home. “Like the childhood game we played, rock and paper affect each other and must be brought into the kind of balance an artist and engineer can design,” Musick explains. “I set up a visual balance.” The artist explains that paper wrapped around a rock not only allows the fragile paper to assume the strength of the rock, but also serves as protection for the stone. Our Fragile Home is created and constructed with the seven main tools of the artist’s toolbox: stone, wood and beeswax are the natural elements; and, glass, steel, Lexan plastic, and paper are the man-made elements. Musick creates what she calls a “visual balance – harmony out of tension between elements.” The juxtaposition between man and nature are echoed through Musick’s artistic vocabulary. Musick’s media, like her environment, has changed over time. Originally living in an urban setting, the artist was influenced by German Expressionist, Kathe Kollwitz (1867-1945) whose war memorial to her dead son, Grieving Parents, communicates her abhorrence of war and her sense of tragedy. As a young mother and wife, Musick painted in an expressionistic style, giving voice to an elevation of emotional feeling in “a layering of veils” that revealed the content of her personal life. Later living in New England, the artist was an observer of nature. When she moved to the Ozarks, Musick was suddenly emerged in a forested environment with a deep-rooted Native American past. The tension between mankind and nature congealed for her around the disconnect between the Native American ideal of living in harmony with the landscape, and the Christian-Renaissance idea of man as the measure of all things. The forced migration of the Cherokee, Chickasaw, Choctaw, and Seminole Indians (1837-39) epitomized the tension that Musick was beginning to feel and visualize in the world. She embodied the imbalance in a moving installation of stone monoliths progressing through the forest, down a creek bed, across a stream and up the far banks. A moving succession of stone more than sixty-five feet long, the installation of The Place Where They Cried – A Trail of Tears feels bereft just as the hundreds of empty shoes at the Holocaust Museum fill the viewer with a sense of loss. “The sculptures reflect American Indian culture and the history and the tension between man and nature [in North America] for nearly twenty decades,” Musick says. Writing in ‘Art New England,’ Christopher Volpe said, “Pat Musick’s minimalist installations of natural stone, steel, and wood invite us to contemplate a quiet constellation of beauty, tension, rupture, and reconciliation between humanity and the natural world.” In the same way that Michelangelo’s Captives emerge as beauty from the rough hewn marble that confines them, Pat Musick is able to find a transcendent beauty by making order out of the chaotic elements of our world. Resolution and reconciliation are synonymous to the artist. She reconciles diverse elements to find a resolution of peace, Zen harmony, and quietude. “At exhibitions of my work, people tell me that they feel a sense of peace,” Musick says. The artist’s feelings about her subject matter come through to her viewers and establish a dialog with them. In After the Void, the artist places slate fragments – of the earth and symbolic of the planet – in metal troughs that separate earth from emptiness as our atmosphere separates us from the darkness of space. The troughs are of man-made material, so by extension of the metaphor, mankind must use ingenuity to be stewards who protect and sustain the planet. In the installation, Our Fragile Home, Musick began with the words of the space travelers about the earth: fragile, beauty, harmony, balance, protect, sustain, nature and steward. Asked if words are man-made, Musick replied, “I feel that mankind is only another part of nature. When you consider the cosmos; we are really only a speck. Language has evolved over time as a response to human evolution, so language is not man-made in a pure sense.” Thus the identical words in six different languages are destined through this exhibit to become an integral part of human consciousness about the planet. In the catalog, Our Fragile Home, Jospeh Madeira, Director SVAC, writes, “Very few have been able to step back, like artists do with their work, to look objectively at the planet with a different perspective. But those few who have had the opportunity to step away from this world have had a shared experience.” The artist takes the astronaut and cosmonaut words as a message from the distant perspective of space. Through the artist, humanity is encouraged to understand and give voice to the words from space in order to enact positive changes that counter-balance the man-made and natural occurrences creating tension on earth. In that way Musick’s art has an ecological and environmental message. “In order for existence to continue on earth, there has to be a harmonious balance between man and nature.” When asked if her art has a message, Musick describes not a didactic proscription as much as a hope that her art will encourage communal contemplation. “My work has a message that encourages a dialog with the viewers.” Communication is extremely important to the artist and her art allows her the means to touch mankind in visual terms. In Comfort, the artist creates a word quilt of Kozo, hand-made, mulberry paper and the eight words in six languages. The quilt drapes over a wooden construction resembling a colonial quilt frame: the words create patterns of light through the printed letters. The emerging prototype transforms into an archetype or inherited memory represented in the communal mind by a universally understood symbol for comfort. “My work is essentially optimistic,” Musick asserts. Our Fragile World is an abstraction of the concept of a finite world stacked precariously on top of man-made demands, (for sustenance, shelter, clothing, warmth, and perhaps love). From the metal ground-work leading upwards through the layers of slate to the most fragile branches of the trees and the easily broken eggs the viewer sees a visual confirmation of the earth as fragile yet filled with beauty. The topmost biosphere layer of the artist’s construction and of our living planet is the most precarious and fragile. “The title,” Musick asserts, “is secondarily important. Of primary importance is that the viewers allow themselves to be open to what I am doing as an artist and for them to relate to the art – each in is his/her own way. Their experience is enriched by how I feel about my subject matter.” Walking through Our Fragile World the viewer, according to Madeira, “begins to ponder the opposing notions of stability and permanence, with fragility and transience.” There is beauty even in the tension and juxtaposition of opposing elements – of mankind and nature. Musick makes a visual balance out of the chaos of opposing forces in our world. “In order to exist together, there has to be a harmonious balance,” Musick says. 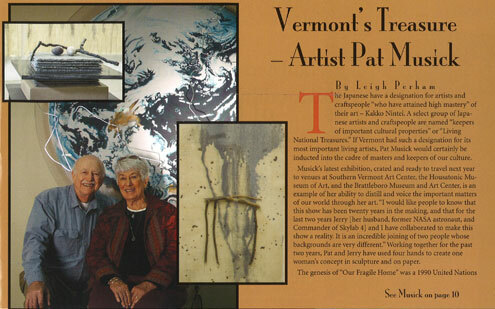 Musick, who lives in a retirement village in Manchester, Vermont, remains a vital, working artist. Her current series of works on paper, Trees, will be on display at the Governor’s Gallery in Montpelier next summer. Musick believes that an artist in the late stages of her life strives in her art for transcendent moments: work that exceeds the limits of experience and exists outside the conditional universe of understanding. “At my stage in life,” she says, “I think about death, about my place in the cosmos.” Painted on Japanese, Kozo, mulberry paper, the artist’s robust yet delicate tree supports a graceful abundance of individual, autumn leaves that seems to whisper impermanence with the lyrical, elegance of a Chinese scroll. “I have learned that the tree has an outer garment that blazes and fades, leaving the strong trunk and branches to continue in existence,” Musick explains. In the end, Musick believes, humans have a soul that continues after the body has faded. At the end of our lives have we evolved, as perhaps Titian did as an artist, to be the best that we can be? “We evolve to be more tolerant, more forgiving, to see a broader perspective,” Musick says. “This last series, Trees, shows me that the spirit goes forward.” Musick’s artistic spirit is a treasure for Vermonters who will have the opportunity to experience her compelling work when Our Fragile Home opens in the spring. Pat Musick’s installation, Our Fragile Home, will debut at the Southern Vermont Art Center as the Wilson Museum’s opening spring exhibition. The Wilson Museum is also home to the art center’s permanent collection of eight hundred American works of art. SVAC holds an important collection by Luigi Lucioni, (1900-1988), an American realist, landscape painter and a superb draughtsman, whose detailed observations of nature resulted in a commitment to realism in the landscape. The museum also holds works by painter and printmaker, Reginald Marsh, (1898-1954), and paintings by Ogden Pleissner, (1909-1983), who used watercolors as a visual war correspondent, taught at Pratt Institute and maintained a studio in Manchester, Vermont. Although the majority of the SVAC collection focuses on American realism, the art center also holds work by Kenneth Nolan, (1924-2010), an abstract expressionist, minimalist, and later, color field painter. “Our primary goal or objective, our mission is to bring an awareness of art to the community through exhibition,” says Executive Director, Joseph Madeira. To that end the arts center incorporates not only the Wilson Museum, but also Yester House, a Georgian mansion where gallery space is guaranteed for artist members. In the summer of 1922, the Dorset Painters, the original artists behind SVAC, envisioned an environment where local artists could exhibit and sell their work. Over the years artists like Jay Connaway, (1893-1970), and Norman Rockwell, (1894-1978), have exhibited as artist members at SVAC. Joseph Madeira explains: “Southern Vermont Art Center was built on showing the work of artist members; built on grass-roots exhibitions. The diversity in art by our members keeps us true to our roots.” Madeira is proud to welcome Our Fragile Home by an artist with roots in Vermont to the Southern Vermont Art Center. For all of my life (since I was four), I have made art. Using my hands to create artwork is a privilege and a joy. If the art has a sense of peace...a zen feeling, then I have succeeded in my desire to make work that is harmonious and whole. In order to achieve that goal, the art must be experienced. This website will provide that encounter and introduces you to my sculpture, paintings and drawings that span a forty year period. You will be able to see from whence I came, the changes over time and where I am going today. There has been much growth. I began as a painter and transitioned to wall sculpture, then free standing works. Over the years, I have retained my interest in two dimensions by making works on paper. The art moved from expressionistic to abstract to conceptual and has undergone a steady reduction to simpler elements and media. The materials I use are stone, steel, wood, canvas and kozo paper and beeswax. Stone, wood, and beeswax reflect the natural world and steel, canvas and paper, the human. My artistic goal is to express the relationship between mankind and the environment and the tensions we exert upon each other. I search for resolution and reconciliation. I find it in the process of rebirth and renewal. From the natural world process of regeneration, I have learned that from adversity comes the chance for new beginnings. I make both large and small, indoor and outdoor sculpture and works on paper. My work is represented in the permanent collections of over fifty museums and public spaces in the country. I have MA and PhD degrees from Cornell University and I am the author of four books. I am represented by MK Fine Arts, Andover, New Hampshire, West Branch Gallery, Stowe, Vermont, Edgewater Gallery, Middlebury, Vermont and in the Fall, 2011 The Clark Gallery, Lincoln, Massachusetts.